An elevation map of the asteroid Vesta, which scientists think is one of the primary sources of basalt in the Asteroid Belt. 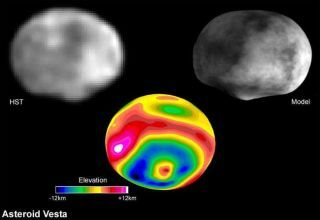 Recent studies have turned up asteroids that have the mineral but that do not belong to Vesta. "We need now to observe both objects in the near-infrared range to confirm whether they have a basaltic surface," said study leader Rene Duffard of the Institute of Astrophysics of Andalusia in Grenada, Spain. "If they do, we will need to try to work out where they came from and the fate of their parent objects. If they do not, we will have to come up with a new class of asteroid." The finding, made using photometric data from the Sloan Digital Sky Survey (SDSS), was presented at annual European Planetary Science Congress in Potsdam, Germany. Until recently, all basalt-containing asteroids were thought to be fragments of Vesta. In 2001, scientists discovered (1459) Magnya, an object in the outer asteroid belt that contained basalt of a slightly different chemical composition, suggesting it did not belong to the Vesta family. The lack of basalt and another mineral, olivine, in asteroid belt objects has long puzzled scientists. These two minerals would have formed the crust and mantle, respectively, of belt objects the size of Vesta or larger; theory predicts that more than half of all asteroids should be composed of one or the other of these substances. "Finding either one is significant because both are quite rare, much rarer than they should be," said Michael Gaffey, a geologist at the University of North Dakota who was not involved in the study. "Roughly 99 percent of the stuff we expect to see [in the asteroid belt] is missing." One possibility, Gaffey told SPACE.com, is that the parent bodies of Kumakiri and 1991 RY16 were long ago worn down by repeated collisions into smaller and smaller pieces, which have since been whisked out of our solar system.